P4 meets and exceeds the specifications as to type, absorption time, moisture availability and useful life span of the California Department of Transportation (Caltrans). 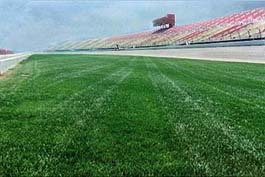 With Randy Hlubik, RHA Landscape Architects-Planners, Inc., and Valley Crest (Environmental Industries is the parent company) landscape contractors of this 529 -acre, state-of-the-art racing super speedway, some 14,000 pounds of Broadleaf P4 were utilized under nearly 2,000,000 square feet of fescue sod. 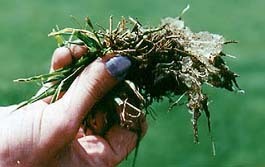 The sod, thanks to P4, rooted within a week and helped to protect it from the wind and heat of weather and racing. 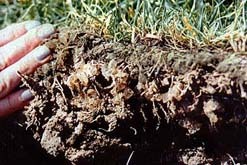 The water and nutrient -storing granules assure stress-free growing material, sod, in this instance, particularly during periods when irrigation systems are unable to be operated due to racing or malfunction. Host of the inaugural NASCAR California 500. 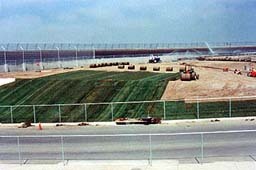 California Speedway is owned by Internatiomal Speedway. P4 is the only water-storing polymer used in the construction of the nationally acclaimed Widow's Walk Golf Course, the environmentally friendly (half the water, fertilizer and chemicals) creation of architect Dr. Michael Hurdzan, in the Boston suburb of Scituate, MA.